Hey John, I noticed back in 2010, you said that you paint all your backgrounds first and then your characters to get a consistent look. Does that mean you have 16 masonite boards with paper taped to them throughout your studio? Or are you reusing masonite or doing something completely different? Thanks. Your website is incredibly informative. You’re a champ. For any book project I’m working on, I have sixteen 3/16″ plywood boards with watercolor paper stapled to them. They are each 24″ x 16′. I like to paint on Arches 300 lb hot press watercolor paper, which comes in 22″ x 30″ sheets. Cut in half, that’s 22″ x 15″ which fits nicely onto my plywood boards. I staple the paper on with a staple gun. I trace the sketch onto the paper using transfer paper (like carbon paper) and mask off 3/4″ beyond the page trim with masking tape. Why sixteen? A typical picture book is 32 pages long, and I can get a two-page spread onto one of those 22″ x 15″ sheets. Sixteen times two is thirty-two. The cover art is usually done before I start on the interior pages, so that would be a 17th board. This is an efficient way for me to work. I can put a board on my easel, paint the sky, then put that to one side and grab another board and paint the sky. When the sky is finished on all the boards, I start painting backgrounds. I work from far to near. The very last thing I paint are the characters. I saw Brave on Friday. As usual with Pixar, the animation was fantastic. I had a problem with the story. Here’s the big rule of storytelling: your audience must care about the characters. I didn’t have any particular reason to like Merida. She’s pretty but self-involved. 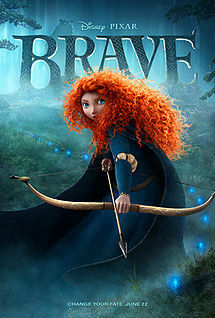 The story has a subtext of ‘girl-power’: Merida is a free spirit, she’s being forced to marry according to the rules of a male-oriented system. The big archery contest we’ve been seeing in the trailers is a reprise of the episode in Robin Hood, but drained of all suspense. We know Merida is a good archer, so it’s no surprise when she beats the spectacularly incompetent boys. Consider that when Robin Hood was tempted to enter Prince John’s archery contest it was a death-trap. Robin was obliged to disguise himself—even knowing his skill would ultimately give away his true identity. Of course he enters in spite of that certain outcome, because his character is rash, impudent, risk-taking, proud and—well—brave. Merida faces no such risk of capture and hanging as Robin Hood did, only her parents’ displeasure (her mom’s, at least). We’re supposed to believe her actions caused a small war among the rival clans, but c’mon, they were all there for a dust-up anyway. Another flat character is the witch—eccentric, neither likeable nor unlikeable enough to make her interesting. She’s there merely to push the plot along. The male characters are silly, blustering and ineffectual when they’re not actually causing harm. For me, the only character with depth was Merida’s mom, who was once surely just like Merida but bowed to convention for the benefit of her people. The friction between Merida and her mom is well-done because the mom has dimension. Merida never thinks of anyone but herself (okay, she swipes some pastries for her little brothers) until she’s forced to. But even then, it’s a case of having gotten hersef into a horrible situation she has to get herself out again. I wasn’t convinced that it was a character-changing event for her. After she makes everything right with her mother, she goes back to riding her horse and shooting arrows at things. Instead her parents change, so that Merida doesn’t have to do something she didn’t want to in the first place. I would have liked Merida better if her Fate, which was so important to her, required a vision beyond herself and her desire not to be bent by convention. Merida’s mom was interesting because long ago she’d grown up. By the end of the movie there was no reason to believe Merida would ever grow up. What’s so brave about that? Here are close-up scans of the color studies I created for Jack and the Giant Barbecue. They’re shown here individually, but they were created together on one big piece of watercolor paper as a color script. Each study is roughly 6″ x 4″. These studies will be framed and for sale at the Giant Barbecue Party tomorrow! When the first Spanish explorers arrived in the new world they found the indigenous people of the Caribbean preserving meats in the sun. This is an age old and almost completely universal method. The chief problem with doing this is that the meats spoil and become infested with bugs. To drive the bugs away the natives built small, smoky fires and placed the meat on racks over the fires. The smoke kept the insects at bay and helped preserve the meat. Tradition tells us that this is the origin of barbecue, both in process and in name. The natives of the West Indies had a word for this process, “barbacoa”. It is generally believed that this is the origin of our modern word barbecue, though there is some debate on the matter. Don’t forget to swing by the studio Saturday for the Giant Barbecue Party! My pal Paul Schifino, who hired me to create an image for the Pittsburgh Public Theater’s As You Like It, sent me this terrific tote bag made out of the recycled banners and billboards. UPDATE! Laura is the lady who created this wonderful tote bag. You can see more of her work here. Giant BBQ Party on Saturday! If you’re anywhere near Oil City, Pennsylvania this Saturday, June 9th we’re throwing a Giant Barbecue party—and you’re invited! It’s from noon to 3:00. Come on up to Studio 27B in the National Transit Building on Seneca Street. We’ll have free Texas barbecue and lemonade, hot tamales and cow tails. I’ll be reading Jack and the Giant Barbecue and painting a picture which we’ll raffle off to a lucky winner. Speaking of barbecue, did you know the Caddo Indians in Texas were smoking meats over smoldering wood over 10,000 years ago? You can read a dandy history of barbecue over here.